Expect complimentary breakfast free airport transportation and an outdoor pool at the Quality Inn Fairmont. All 82 rooms at the low-rise Quality Inn come with premium cable TV alarm clocks coffeemakers data ports and Wi-Fi availability. Some rooms are non-smoking. The hotel serves a free full American breakfast each morning. For outdoor eats feel free to enjoy the barbeque grills and picnic area. There's also a seasonal outdoor pool. Parking is available. Be sure to reserve ahead to make use of the hotel's complimentary airport/area shuttle. 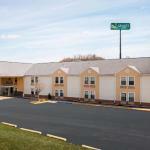 The Quality Inn is less than a mile from I-79 and four miles from Prickett's Fort State Park. It's a mile-and-a-half from the FBI Center and NASA. For shopping and dining drive 18 miles to the Meadowbrook Mall. Valley Hills State Park is 20 miles away. Pittsburgh International Airport is 88 miles from the hotel.